Spinal stenosis is a narrowing of the spinal canal, causing pressure on the nerve roots, and resulting in pain. This usually occurs in the lumbar spine (low back), occasionally in the cervical region (the neck), and less often in the thoracic spine (in the upper back). MRIs, CT scans, and EMG studies are diagnostic studies used to determine this condition. 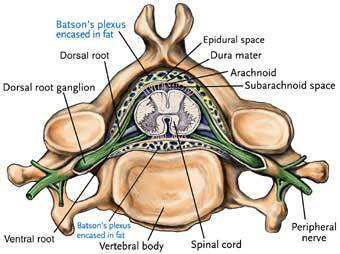 Spinal stenosis is most often caused by degeneration of the disk between the vertebrae due to osteoarthritis. Rheumatoid arthritis is associated with inflammation and enlargement of the soft tissues of the joints. The areas of the back with the greatest mobility (for example, the neck area) are often the ones most affected in people with rheumatoid arthritis. In the lumbar region, pressure on the spinal cord or on nerve roots branching out from the pelvis may result in sciatica. Pressure in the cervical region of the spine may produce similar symptoms in the shoulders and arms. Paget’s disease, a disease of that causes abnormal growth and distortion in a number of different bones. Fluoridosis, when an excess amount of fluoride thickens bone and contributes to stenosis when there is a pre-existent narrowing of the canal. Symptoms of Spinal Stenosis are similar to those of cervical disk disease or sciatica. Spinal Stenosis can often be treated without surgery or invasive procedures. Proper exercise, anti-inflammatory medications, epidural injections and chiropractic care are all possible methods for relieving pain due to spinal stenosis. In limited cases, spinal surgery may be an option. If you continue to suffer with spinal stenosis and your current treatment plan leaves you feeling hopeless, perhaps a fresh set of experienced eyes can change your outlook. Since 1990, Dennis M. Lox, M.D has applied his personal interests in sports medicine, cutting-edge regenerative medicine and chronic pain management to helping patients increase their quality of life. Contact us for an appointment at 727-462-5582.